Challenge Your Balance for Fun and Profit! Here’s some inspiration for you: One of my colleagues, the effervescent Mary Derbyshire in Rhode Island, gives Alexander lessons and exercise classes to senior citizens, many of whom are in their nineties. Mary taught a great workshop on balance at our recent society meeting and gave us a ta ste of the rhythmic movement routine she gets these vibrant seniors doing. If you figure the routine would be easy and perhaps a bit boring, think again! It was lively, fun and challenging. These seniors must rock! As does my 92 year old mom*, who takes Alexander lessons and can do this (see picture). Balance is the new buzzword, especially to a population whose greatest danger is falling. It’s also really important for the rest of us and you’ll find it richly rewarding to work on it. My students and I do! Here’s why it’s so worthwhile. Like it or not, all our sensory systems degrade with age, from young adulthood onward. One that we tend to overlook (unless it malfunctions) is the vestibular system, that strange and amazing assortment of apparati in the inner ear entirely dedicated to balance and orientation in space. It starts declining in one’s mid 20s and can be practically non-operational by one’s 80s. The great news is that we don’t have to settle for decline. We can not only preserve but actually improve the functioning of the vestibular system by giving it jolly little challenges. It’s easy! It’s fun! Hooray for neuroplasticity! Consistency is important, so find some mundane daily task to enliven and enhance with a balance game. 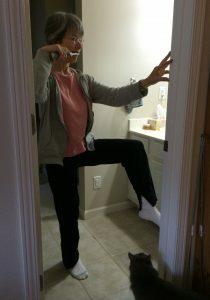 One of my students (also named Mary) had told me ages ago that she stands on one leg while brushing her teeth and that it really helped her improve her balance. “How brilliant!” said I, with genuine admiration. We proceeded to have fun using Alexander principles to find a livelier and more dynamic balance, which makes the endeavor much more interesting and satisfying. I’d like to say I immediately followed her stellar example, but it took me a while to remember to make it a daily practice. (My advice: write a post-it to yourself.) The great news is, the game really does improve your balance, with the added bonus of never again being bored by a necessary chore. Please make sure you do this safely, of course. Make sure you won’t topple into something. Check the space carefully. 1 Stand by a wall that you can touch and use for as much support as you need, with the non-tooth-brushing hand. Let your feet spread onto the ground and become aware of the space surrounding you. Without pushing, let gravity flow through you into the ground. Think of orienting and opening away from the ground, upward and outward, like a fountain. See out into the space. 2 As you brush, try lifting one foot, with minimal effort. You can trail the toes until you find some initial balance, then experiment. 3 Notice your whole nervous system registering the unfamiliar challenge. Sway will increase. You may find yourself tightening to try to find stability. 4 See if you can allow your brain and muscles to calm down and let your vestibular and kinesthetic systems find a dynamic, elastic balance, letting go of gripping. Find the flow of gravity towards the earth; find the upward and outward flow of the fountain again. See out into the space. 5 If it’s a piece of cake, try closing your eyes. Just please make sure you can do it safely. Keep that wall nearby, for as much support as you need. Now you’re REALLY talking vestibular challenge! If you read my previous blog you know I’m a devotee of tai chi, so I love to practice tai chi balance moves whilst brushing. You’ll gain a lot more than just improved balance from this little endeavor, actually. Working on your balance every day will improve your brain’s neuroplasticity as well as your vestibular and kinesthetic liveliness. If you know how to apply principles of the Alexander Technique, you will be able to work on your balance with much more freedom and elasticity. If you found this helpful, please share…. Ed Bilanchone is a marvelous Alexander Technique and Tai Chi teacher in the greater Washington DC area, y’all! Hi and thanks for this article. I encourage all my students to learn how to keep central balance as they just bend one knee and keep the toes (bent) on the ground, without swaying around. It’s astonishing how few people can do it. If you think about it, it’s the primary move for walking. I love the idea of brushing your teeth on one leg and will implement it with my students too (and myself!). There are so many simple yet profound ways to work on balance, yours is great! I think one of the greatest benefits from the little balance challenges is that they let you meet yourself gently, in the moment, and really experience your natural variability. You meet and acknowledge yourself, where you are, and invite yourself to find more freedom and elasticity from there. Sometimes dynamic balance is easy to find, sometimes very elusive. But the overall trend will be toward improvement, by working on it every day. Great Tully, I have been experimenting with this for myself after a nerve impingement in my leg. Really helps reconnect!! Yes, I agree! I’m so glad it’s been helping you!